Year 6/Parents 1 Buy your child an atlas, not only will it help their studies, you can look up the location of places you are travelling/have travelled. 1 Year 6/Parents 1 Buy your child an atlas, not only will it help their studies, you can look up the location of places you are travelling/have travelled to, find unknown places in the news, or ask them to locate the places we have studied. 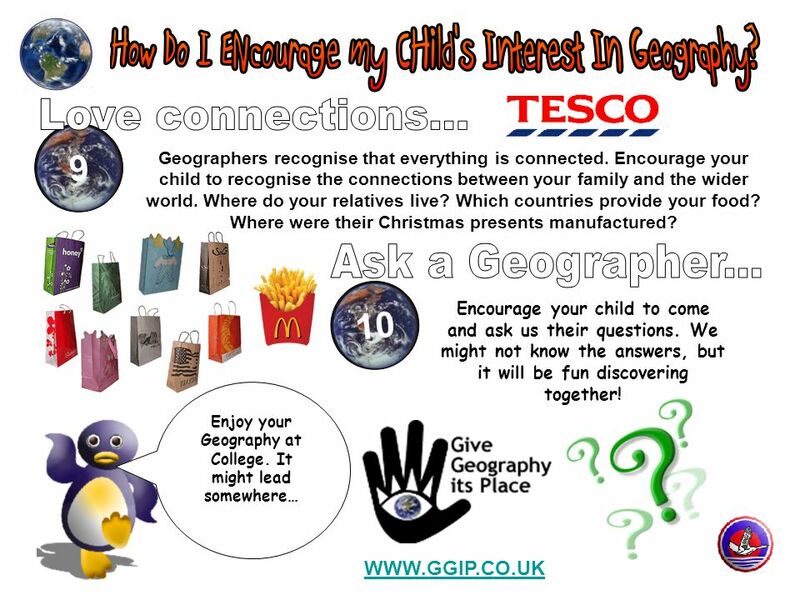 So your child is interested in Geography, so heres ten top tips that will help encourage their interest… 2 In Year 7, each student receives a free Ordnance Survey map of the local area. Ask your child to locate their home and the homes of others on the map. Ask them to provide 4 and 6 figure grid references. If you dont know how to do them, get them to teach you! You could also ask your child to plan a family walk or outing using the map. The Geography Department uses the Oxford School Atlas. 2 3 Geography is topical, so encouraging your child to watch the news and read newspapers, will help inform them of the issues facing the World. Geography is full of opinions, so debating controversial topics is a a way of training the Geographer within! 4 5 Google Earth is a free programme to download (http://earth.google.com/)http://earth.google.com/ that provides access to a 3.D. Earth and quality satellite imagery. Great to explore places you have been or places you dream of travelling to… Visit the library! 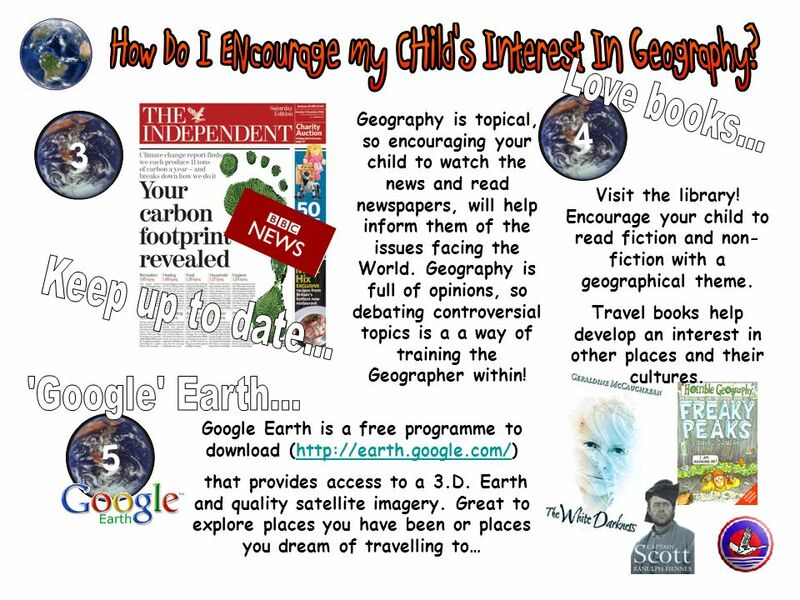 Encourage your child to read fiction and non- fiction with a geographical theme. Travel books help develop an interest in other places and their cultures. 3 6 7 8 Encourage your child to watch fiction and non- fiction films with a geographical theme. A great deal of geographical knowledge can be gained from both the March of the Penguins and Happy Feet. Geographers love images. 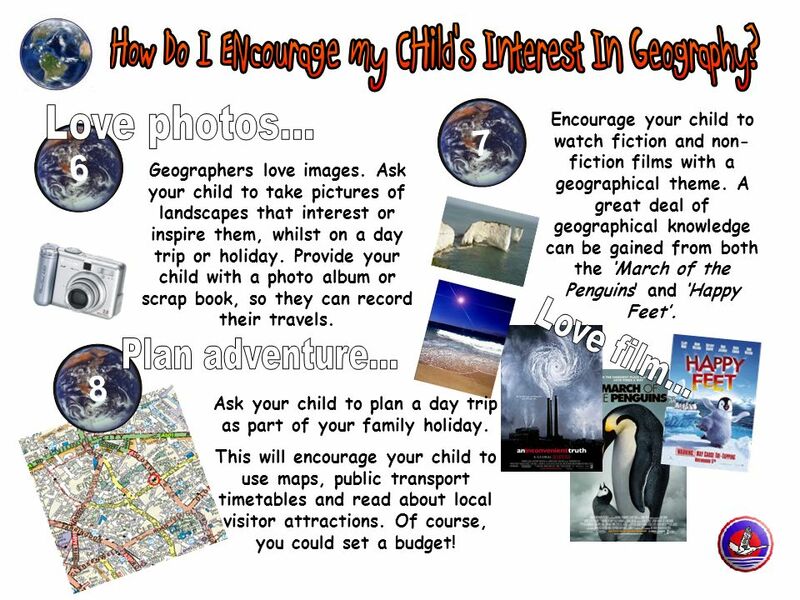 Ask your child to take pictures of landscapes that interest or inspire them, whilst on a day trip or holiday. Provide your child with a photo album or scrap book, so they can record their travels. Ask your child to plan a day trip as part of your family holiday. This will encourage your child to use maps, public transport timetables and read about local visitor attractions. Of course, you could set a budget! 4 9 10 Enjoy your Geography at College. It might lead somewhere… Encourage your child to come and ask us their questions. We might not know the answers, but it will be fun discovering together! WWW.GGIP.CO.UK Geographers recognise that everything is connected. Encourage your child to recognise the connections between your family and the wider world. Where do your relatives live? Which countries provide your food? Where were their Christmas presents manufactured? 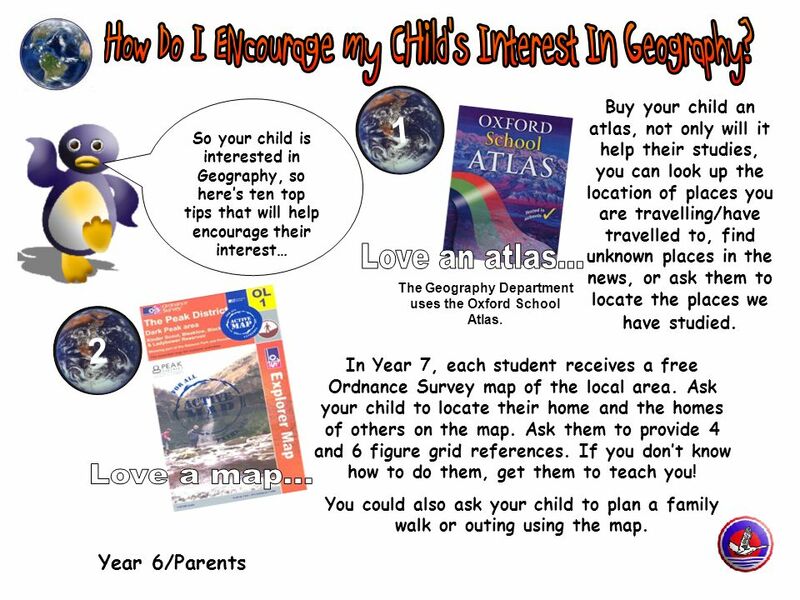 Download ppt "Year 6/Parents 1 Buy your child an atlas, not only will it help their studies, you can look up the location of places you are travelling/have travelled." The Research Process Library Resources What is available in your Library? Planning for Global Learning. Wortley Village How are people dependent on the wider world Global interdependence What connects people and places? What. Parent Coffee Afternoon Developing Confident and Enthusiastic Readers Monday 7 th October 2013 Mrs Bitton and Mrs Nielsen. Google Earth Team Ring Dings Zachary Abbott Sherreé evans Olivia Orlandini. Helping your child at home 19th November Outcomes Considered what we know about homework and what parents can do to support learning Learnt strategies. MS.ERUM ABID DAPS SEAVIEW HISTORY, GRADE 6.  Adopt 21 st century teaching approaches to enhance and build interest in students for appreciation of History. The Culture of our First Year Students. How many books read over the summer 2003. The IPC and BIS. Entry Point…Getting to know you! Who’s the most famous person you’ve ever met? Creating a Google Earth Tour Self-ChosenProject by Phil Wilson Next. What is Google Earth??  Google Earth is a virtual globe, map and geographical information program  Created by Keyhole, Inc, a Central Intelligence Agency. Reading Sarisbury Infant School. Why is reading important? Creating a love of reading in children is potentially one of the most powerful ways of improving. The Reality Our current education and exam system is heavily reliant on literacy. This means that successful learning and exam performance depend to a. All About 3797 Level 1 Just to clear this up, ‘3797’ is NOT the name of a Boeing aeroplane. The figure ‘3797’ is just a course code, so relax and don’t.